FirstWorks Presents Bill T. Jones in Providence, RI at The Vets. March 10, 8 p.m. Tickets start at $18. On sale now at 401-421-ARTS (2787) or at first-works.org. FirstWorks presents Bill T. Jones, one of America’s most visionary artists and a Tony Award-winner for Best Choreography in Broadway hits “Spring Awakening” and “Fela!”. In a thrilling new work, Story/Time, Jones narrates 70 enticing and reflective stories in 70 minutes amidst a landscape of inspired movement performed by the Bill T. Jones/Arnie Zane Dance Company. Story/Time – an exhilarating collection of poignant, hilarious and sometimes haunting tales. Bill T. Jones/Arnie Zane Dance Company in Providence at the Vets, March 10 at 8 p.m. Tickets at vmari.com or 401-421-ARTS (2787) or at first-works.org. Tickets start at $18. FirstWorks also provides extraordinary opportunities to engage in person with this master artist at the peak of his powers through workshops and conversations, visit first-works.org for details. 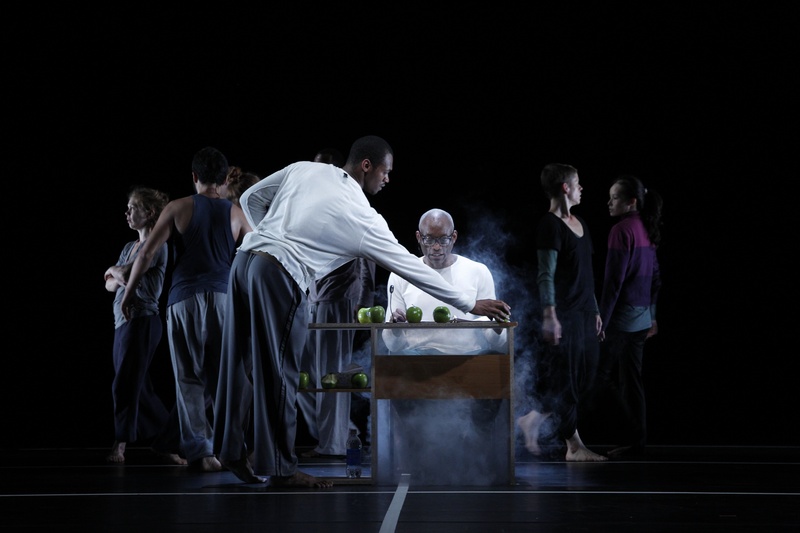 In Story/Time, Jones' inventive choreography frames a cascade of original and often autobiographical short stories, narrated center stage by Jones himself and visualized by his international company. Influenced by legendary artist and composer John Cage’s 1958-59 work, Indeterminacy, Jones creates a collage of dance, music, and short stories arranged anew for each performance by chance procedure. “With Story/Time Bill T. Jones is audaciously bridging his avant-garde creative self and his Broadway showman self,” said Kathleen Pletcher, Executive Artistic Director, FirstWorks. “FirstWorks is thrilled to connect our southern New England audiences with this creative force." Jones fuses the age-old art of storytelling with contemporary dance and music, inspiring audience members to find meaning and connection in the sweep of randomized, disparate elements. Jones’s powerful voice narrates and at times sings micro-stories drawn from his own life, including tales handed down through generations of his family. In an exciting new collaboration, composer, musician, and intermedia artist Ted Coffey composed and performs Story/Time’s original acoustic and electronic score. Editor’s note: Story/Time contains adult themes. Beginning with an unprecedented collaboration with Providence’s Department of Art, Culture + Tourism, FirstWorks was launched in 2004 as a vehicle to build community, reach underserved audiences, and present extraordinary arts programs that elevate Providence’s national profile. In the eight years since, FirstWorks has produced 22 groundbreaking arts festivals, attracted more than 98,000 participants, presented over 345 international artists and innovators, engaged more than 100 nonprofit community organizations and schools, and grown into a multidimensional arts organization recognized with thirteen National Endowment for the Arts (NEA) grants. The presentation of Bill T. Jones/Arnie Zane Dance Company Story/Time was made possible by the New England Foundation for the Arts' National Dance Project, with lead funding from the Doris Duke Charitable Foundation and additional funding from The Andrew W. Mellon Foundation and the Boeing Company Charitable Trust. Bill T. Jones, a multi-talented artist, choreographer, dancer, theater director and writer, has received major honors ranging from a 1994 MacArthur “Genius” Award to Kennedy Center Honors in 2010. He was inducted into the American Academy of Arts & Sciences in 2009 and named “An Irreplaceable Dance Treasure” by the Dance Heritage Coalition in 2000. His ventures into Broadway theater resulted in a 2010 Tony Award for Best Choreography in the critically acclaimed FELA!, the musical co-conceived, co-written, directed and choreographed by Mr. Jones. He also earned a 2007 Tony Award for Best Choreography in Spring Awakening as well as an Obie Award for the show’s 2006 off-Broadway run. His choreography for the off-Broadway production of The Seven earned him a 2006 Lucille Lortel Award. In 2011, Mr. Jones was named Executive Artistic Director of New York Lives Arts.